MiRTA PBX has been developed with a great idea in mind: to eliminate every Single Point of Failure. This is the reason every component of the MiRTA PBX can be made redundant. In addition every server added to the MiRTA PBX pool increases the overall capacity, posing no limits to the number of peers, clients and tenants that can be handled by a single MiRTA PBX instance. In the picture each one of the component of the MiRTA PBX is identified. A "five nines" (99.999%) service uptime is often really difficult to achieve. The approach of MiRTA PBX to the service uptime problem is simple: eliminate every Single Point of Failure by enabling multiple servers to perform the same function from a user point of view and letting the users automatically choose one of the working servers. Having multiple servers providing the same service lets you increase the overall capacity just by adding more servers to the pool. Each client can connect to each one of the Asterisk servers in the MiRTA PBX pool and use whichever service he chooses. Internal calls, outbound calls, hunt groups, IVR, conferences, voicemails: each service works in exactly the same way regardless of where the peers are registered. A peer can change server and new calls will be immediately directed to the new server. Providers can receive registration for DIDs from multiple servers for redundancy and calls will be routed among the asterisk servers to reach the registered peer. All the info is stored in the database, so the servers holding the database are the most important servers. The preferred database for MiRTA PBX setup is MySQL. 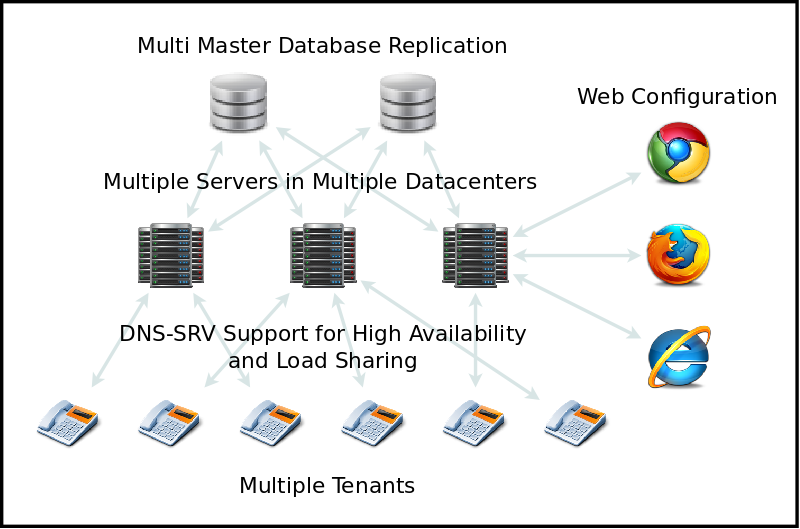 You can choose from the easiest setup with just a pair of database servers in multimaster replication to advanced multi server and multi master replication with dedicated database for Web and Asterisk servers. Each database server in the pool holds ALL the info about the system, so in the event of a crash, no data is lost because all the info is replicated among all the database servers. Every asterisk or web server can query and update any of the database servers and they will keep info in sync among them. To increase the performance of the system, Asterisk servers perform smart caching of info. The interface for managing MiRTA PBX has been written in PHP and due to the fact all the info is stored in the database, the interface can be easily replicated on multiple servers. Every aspect of the configuration or monitoring can be made by any of the web servers because all the info are in one place (replicated on multiple servers), the database! You can start with a single server hosting all the components: Asterisk PBX, web interface and MySQL database. You can increase the number of servers as your business grows, adding more asterisk servers, separating the database from the other components and dedicating a server for the web interface. Increasing the overall capacity can be done without any interruption of service. Our team of experts can take care of all your Linux servers, monitoring them using Nagios and proactively acting to ensure your business continuity.